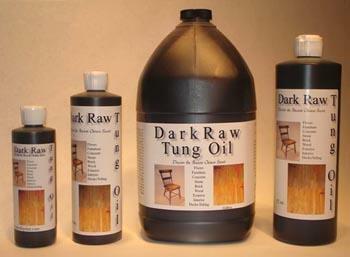 For a safe and natural approach to wood finishing, consider our Dark Raw Tung Oil! Created from the seed of the tung trees, this quick drying oil creates a waterproof finish that resists acids and abrasions to help your home's wood last even longer. Toss the harmful chemicals and introduce your home to a non-toxic, biodegradable alternative. Combine this practical oil with our All-Natural Wood Finishing Citrus Solvent for a natural, dark matte finish to further perfect your stained furniture to provide an antique appeal. Call one of our Amish furniture specialists today at 1-866-272-6773 with questions about our 8-Ounce Wood Finishing Dark Raw Tung Oil and hear all about its many advantages.